Extreme ultraviolet spectroscope for Exospheric Dynamics (HISAKI, SPRINT-A) is the world's first space telescope for remote observation of the planets such as Venus, Mars, and Jupiter from the orbit around the earth. Venus and Earth may be called twins planet, and it recently becomes clear that three terrestrial planets in the solar system including Mars have very similar environment in the beginning era of the solar system. However, in three planets, which could be called the brothers, during the finite period within one billion years after the birth of the solar system each environment evolution of growth and change results into the different and specific current state. At Venus, it became the very dry atmosphere consisting mainly of carbon dioxide as a result that water ran away to outer space, and it is now the scorching world where the temperature of its surface reaches 400 degrees Celsius by the strong greenhouse effect. On the other hand, in Mars, most of atmospheric carbon component producing the greenhouse effect run away to outer space, and it is now in the chilly world. In the Extreme ultraviolet spectroscope for Exospheric Dynamics mission, the mechanism that the atmosphere of these terrestrial planets runs away to outer space is one of scientific objectives. Because in the beginning era of the solar system the sun had more intensely activity than the present, and because the very strong solar wind arrived at the planet, it is in particular thought that a large quantity of atmosphere ran away. The study on interaction of the strong solar wind on the atmosphere of the planet leads to acquiring knowledge of history in the early stage of the solar system. Furthermore, HISAKI will also perform an observation of extreme ultraviolet light from the satellite Io of the Jupiter, and examines how to transfer energy in the plasma environment of the Jupiter from an observation of a sulfur ion flowing out from Io. Satellite's nickname "HISAKI" was named after Hisaki headland located nearby launch site, where the local fishermen pray for safe sailing. 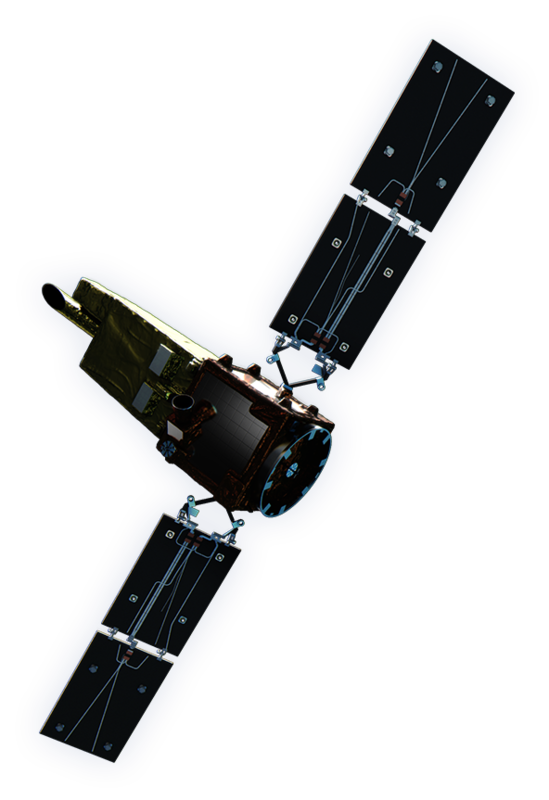 "Hisaki" (SPRINT-A) deals with the diversity of the planets in solar system by optically measuring the Jupiter inner-magnetosphere and atmospheric escape from the terrestrial planet by the optics observation from the earth orbit. "Hisaki" detects a spectrum of the invisible light called extreme ultraviolet rays. Because the intensity of light is quantity to depend on both of strength of the supply energy to promote the emission and the density of the material which really emits light, the general photograph cannot separate two causes. "Hisaki" can retrieve these two physical quantities by observing a spectrum to separate the frequency and the amplitude of the emission. SPRINT-A (HISAKI) is the 1st satellite using SPRINT bus system, which was developed simultaneously with the development of HISAKI itself. SPRINT bus aimed to realize the small scientific satellites as complement of existing scientific satellite lineup at ISAS/JAXA. SPRINT bus will satisfy a variety o demands from the science communities by realizing satellites in short term at low cost. For this purpose, the flexible standard bus was developed, with the modular structure connected via SpaceWire network. 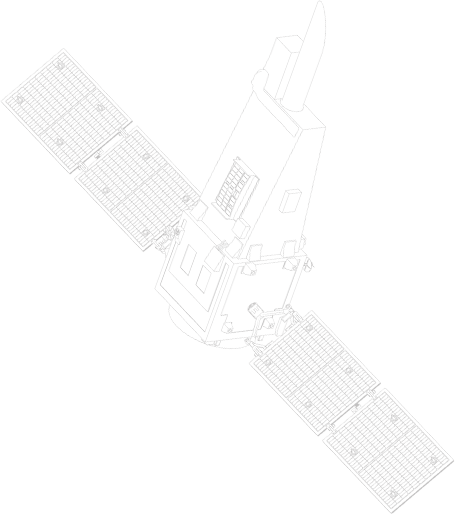 Various tests determine the thermal and structure design of the satellite. First mechanical contact check with the bus and mission system. Thermal vacuum test of mission system. Final check on the ground. Thermal vacuum test of overall system. Vibration test of overall system. Unfolding test of solar array paddle. Loading on epsilon rocket vehicle. Satellite control room at the time of the launch. Hisaki observation revealed the influence of the solar wind deep inside Jupiter's magnetosphere which is the strongest in the solar system. Because Jupiter’s magnetosphere is huge and is rotationally-dominated, solar wind influence in its inner-part has been thought to be negligible. Thanks to long and continuous monitoring of the Io plasma torus (IPT) in Jupiter’s inner magnetosphere, it is found that the dawn-dusk asymmetry in the IPT brightness is enhanced upon rapid increases of the solar wind dynamic pressure. This result is the clear evidence that solar wind effect exists in Jupiter's inner-magnetosphere. Jupiter’s X-ray aurora is thought to occur through collision of oxygen and sulfur ions moving at nearly the velocity of light with the Jupiter’s atmosphere. How can these ions be accelerated to such high speed? In order to investigate a spatial distribution of X-ray aurora brightness in the various solar wind condition, long-term monitoring is conducted by using the Chandra X-ray Observatory, X‐ray Multi-Mirror Mission (XMM-Newton) and Hisaki. Hisaki detected the timing of a change in solar wind condition, Chandra obtained the fine spatial structure of the X-ray aurora and its temporal variations, and the spectra taken by XMM-Newton showed that oxygen in the volcanic gases from the satellite Io and/or in the solar wind emited X-ray. 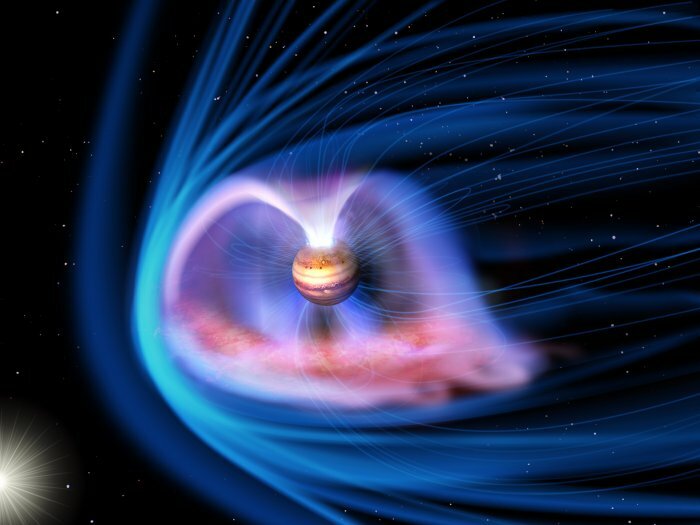 Analysis using the observational data and a numerical model of the Jupiter’s magnetic field indicates that break-up of the X-ray aurora emission is driven by a change in the solar wind condition. 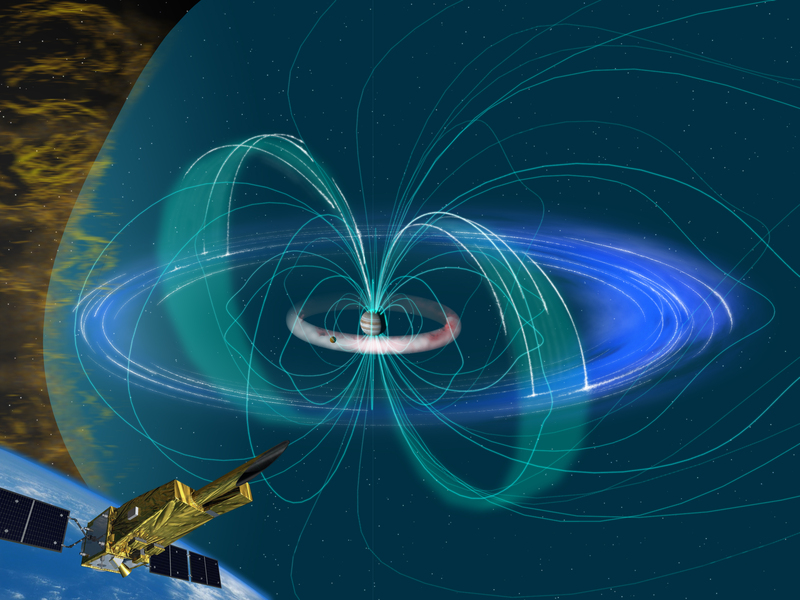 Auroral emission visualizes electromagnetic energy releases in planetary magnetospheres. Jupiter's magnetosphere has been considered to be activated by the internal corotating plasma in contrast with Earth's magnetosphere which is mainly activated by the solar wind plasma. 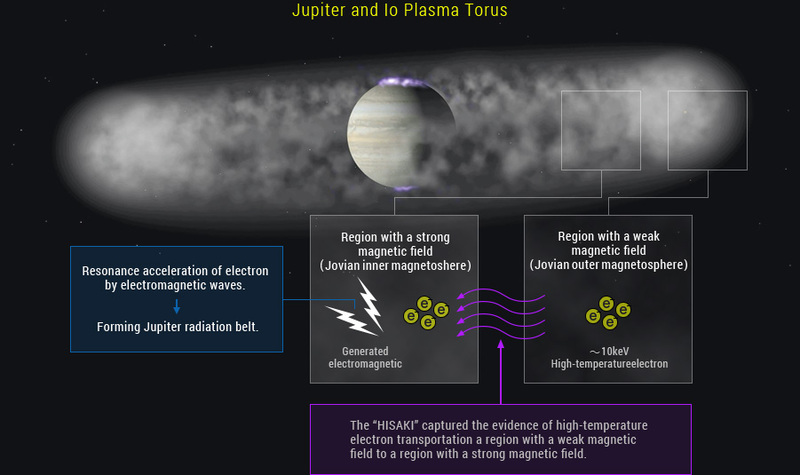 The observations by the Hisaki and Hubble successfully captured the explosions of Jupiter's EUV aurora during the periods when the solar wind was very quiet. This explosion is interpreted as the 'internally-driven' type transient aurora, which is associated with the rotation and magnetic field of Jupiter rather than the solar wind. The highly resolved image taken by the Hubble indicated the morphologies of the auroras which are suggestive of global rapid activations of Jupiter's magnetosphere. 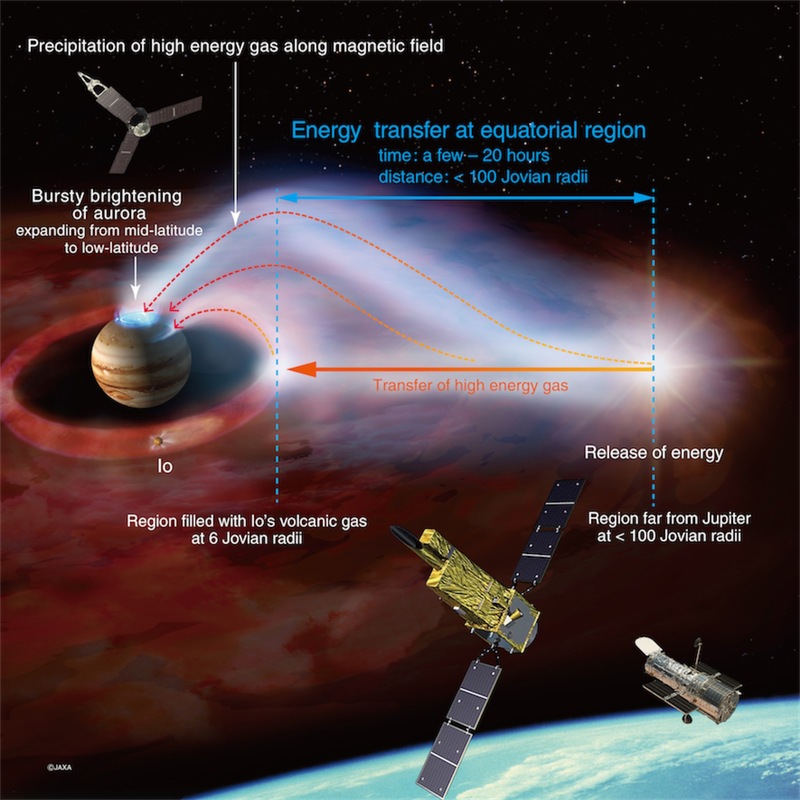 A key process for the particle acceleration in Jupiter’s magnetosphere was given by Hisaki. Jupiter is surrounded by strong magnetic field and its magnetosphere is known to be the largest particle accelerator in our solar system. These high energy particles are thought to be accelerated by whistler-mode waves which is excited by anisotropic hot electrons injected from the outer magnetosphere. However, such electron transportation in the inner magnetosphere is not well understood. Using the extreme ultraviolet line emissions from the inner magnetosphere taken by Hisaki, we show the evidence for global inward transport of flux tubes containing hot plasma for the first time. This fast and continuous resupply of hot electrons is responsible for exciting the whistler-mode waves.